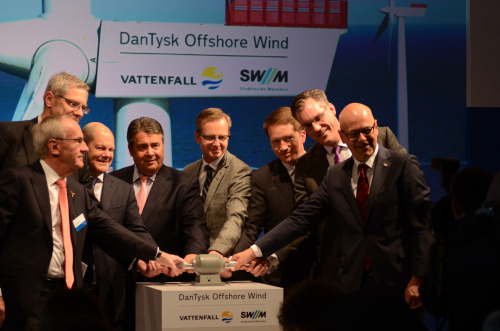 Marking the official inauguration ceremony of the DanTysk offshore wind power plant in Hamburg, Germany, are (from left to righ)t: Lars G. Nordström, Chairman of Vattenfall's Board of Directors, Magnus Hall, President and Chief Executive Officer of Vattenfall, Olaf Scholz, First Mayor of the city of Hamburg, Sigmar Gabriel, German Minister of Economy and Energy, Mikael Damberg, schwedish minister of Economy and Innovatoin, Schweden, Dr. Florian Bieberbach, CEO of Stadtwerke München, Gunar Groebler, Head of Business Area Wind, Vattenfall and Torsten Albig, Minister president of Schleswig-Holstein. Total order volume for largest Dutch offshore wind project to date is valued at more than EUR 1.5 billion. Denmark-based facility will have the capacity to provide advanced diagnostic operations and monitoring services for more than 7,500 installed Siemens wind turbines worldwide. The DanTysk offshore wind power plant is located approximately 70 kilometers offshore west of the German island of Sylt. In waters measuring between 21 and 32 meters deep, foundations anchored in the seabed provide the base on which the wind turbines were erected. The wind power plant can generate up to 1.3 billion kilowatt-hours of electricity every year - equivalent to the total annual consumption of about 400,000 German households. The wind turbines are not the only thing Siemens is providing DanTysk: the German technology group is taking charge of preventive and corrective maintenance to the wind turbines within the scope of a five-year service agreement, and also supplied the turnkey grid connection for the wind power plant, called SylWin1. This direct-current (DC) offshore link, run by the transmission grid operator TenneT, comprises the connecting systems that connect the offshore wind power plant to the German electricity grid. SylWin1 consists of an offshore converter station at sea, and a receiver station on land, 160 kilometers of undersea cable and further 45 kilometers of underground cable on shore. Overall, three offshore wind power plants will be connected to the grid via this offshore link. The owner and operator of DanTysk wind park is a consortium comprising the Swedish power company Vattenfall and Stadtwerke München, Munich's municipal utility. Including DanTysk offshore wind power plant, the installed capacity of all Siemens wind turbines in German waters now tops 1 GW, according to Michael Hannibal, Offshore CEO of Siemens´ Wind Power and Renewables Division. Around 300 wind turbines installed across eight projects contribute to this milestone. Supplementary, Siemens has orders in hand for 700 additional wind turbines to be erected off Germany's North Sea and Baltic Sea coastlines which will add more than 2.8 gigawatts of clean offshore wind generated output to the existing capacity.